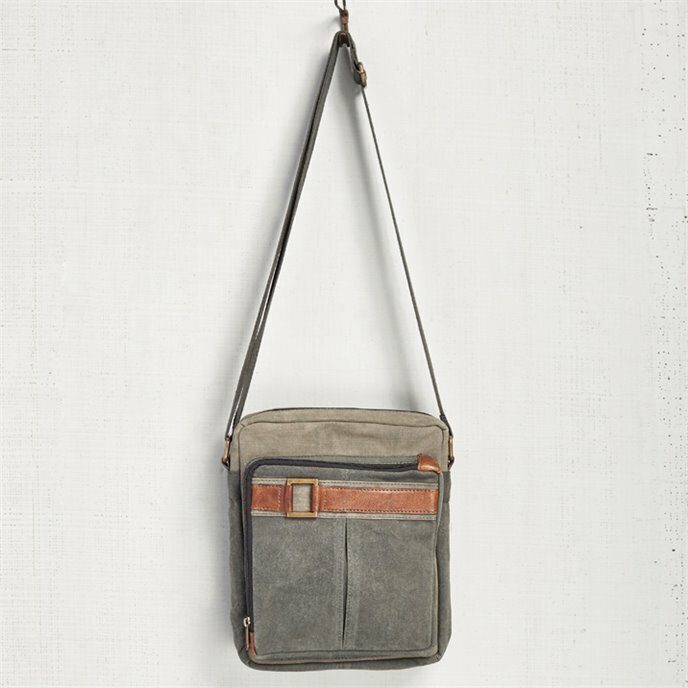 Mona B. Parker Canvas Crossbody Bag | P.C. Fallon Co. The Parker Crossbody Bag by Mona B. is constructed of up-cycled canvas from military tents which gives it a rugged, utilitarian look. Dark grey body features a large zipped pleated pocket on the front with brown leather and buckle accent. Comfortable, cotton woven shoulder strap is adjustable from 12-36". Zippered closure. The roomy interior is lined with grey canvas, and has one zip pocket and one open pocket. Measures 8.5"W x 10.5"H x 2.5"D. The fabric shows the history of its travels which may include stitch marks, minor staining and unique scars and bruises. Color variations and patches add to the uniqueness of each bag. Heavy cotton canvas and genuine leather.